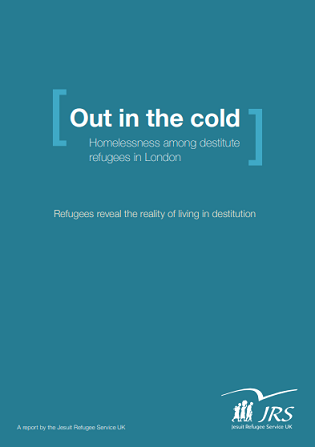 The UK branch of the Jesuit Refugee Service (JRS) last week published a report looking at homelessness and destitution among refused asylum seekers in London. The 30-page report is here. The report draws on the experiences of refused asylum seekers who attended the JRS UK Day Centre in East London, which provides them with support and food. JRS UK notes that those claiming asylum face innumerable barriers to resolving their situation, including a culture of disbelief towards applicants and the UK government sometimes relying on discredited information about countries of origin. In addition, the report says cuts to legal aid mean few solicitors can afford the time for detailed work on a case that requires intensive background research. "Numerous refused asylum claims represent individuals who desperately need a safe haven but who have been let down by a system which appears stacked against them," the report states. Refused asylum seekers who subsequently put in fresh asylum claims often cannot access financial support while they await a response. The JRS UK Day Centre offers help to refused asylum seekers and destitute refugees and it supports an average of 215 people a month. JRS UK says in the report: "Our survey of those who attended the JRS UK Day Centre in East London uncovered a widespread pattern of sporadic street homelessness: indeed the majority of respondents, including men and women of various ages, had been street homeless within the last year. This was coupled with very insecure accommodation in general. The threat of sleeping on the streets was ever present for a large number of those we serve. For those who had accommodation, it was frequently inadequate – dilapidated, dirty and cold, and often overcrowded, even with hostile strangers. We also found indications that many respondents were cornered into living situations that left them vulnerable to abuse. A substantial minority of respondents did not feel physically safe in their accommodation, and many specifically described being afraid of those they lived with. Overall, these conditions, unsurprisingly, had a negative impact on physical and mental health." Sarah Teather, the Director of JRS UK and a former Liberal Democrat MP, said: "What we found is that destitute refugees are living in conditions which are worse even than we feared. The scale of sporadic street homelessness amongst men and women of varying ages and backgrounds is deeply troubling, but so too is the precarious nature of other arrangements, and that so many refugees are living in situations where they feel physically in danger. "In this climate of hostility towards migrants, we seem to have forgotten that at the centre of the public storm are human beings. This report is based on the stories of people who came to Britain seeking sanctuary, but who instead found themselves trapped in destitution, cornered into situations of abuse and forced out in to the cold. Pope Francis reminds us that stories such as these are a sign of the times – that they are a sign we should pay attention to and reflect on. My hope is that this report kindles some sense of our moral responsibility towards those we currently exclude and that it might play a role in a conversion of heart, and open the way for a more authentic human response." JRS UK recommends in the report that all those seeking asylum should be given the right to work, including those who have been refused, for as long as they are in the UK. JRS UK also recommends that the Government should abandon its 'hostile environment' agenda. "This agenda to create destitution is at the root of refugee homelessness. Furthermore, it dehumanises, fostering a cruel society. It should have no place in a decent, humane immigration system. Government should focus on creating a society that fosters values of hospitality, community, participation and respect for dignity," the report states.